The FLipMouse (Finger- and Lip mouse) is a computer input device intended to offer an alternative for people with access difficulties that prevent them using a regular mouse, keyboard or touchscreen. 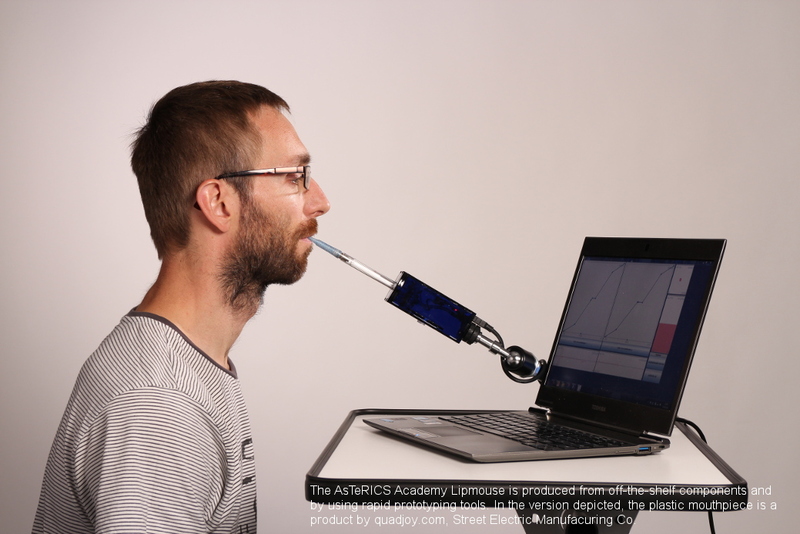 It is designed and supported by the Assistive Technology group at the UAS Technikum Wien (Department of Embedded Systems) and funded by the City of Vienna (ToRaDes project and AsTeRICS Academy project). The device itself consists of a low force (requires minimal effort to operate) joystick that can be controlled with either the lips, finger or toe. The lips are probably the preferred access method as the FlipMouse also allows sip and puff input. Sip and Puff is an access method which is not as common in Europe as it is in the US however it is an ideal way to increase the functionality of a joystick controlled by lip movement. See the above link to learn more about sip and puff but to give a brief explanation, it uses a sensor that monitors the air pressure coming from a tube. A threshold can be set (depending on the user’s ability) for high pressure (puff) and low pressure (sip). Once this threshold is passed it can act as an input signal like a mouse click, switch input or keyboard press among other things. The Flipmouse also has two jack inputs for standard ability switches as well as Infrared in (for learning commands) and out (for controlling TV or other environmental controls). All these features alone make the Flipmouse stand out against similar solutions however that’s not what makes the Flipmouse special. The Flipmouse is the first of a new kind of assistive technology (AT) solution, not because of what it does but because of how it’s made. It is completely Open Source which means that everything you need to make this solution for yourself is freely available. The source code for the GUI (Graphical User Interface) which is used to configure the device and the code for the microcontroller (TeensyLC), bill of materials listing all the components and design files for the enclosure are all available on their GitHub page. The quality of the documentation distinguishes it from previous Open Source AT devices. The IKEA style assembly guide clearly outlines the steps required to put the device together making the build not only as simple as some of the more advanced Lego kits available but also as enjoyable. That said, unlike Lego this project does require reasonable soldering skills and a steady hand, some parts are tricky enough to keep you interested. The process of constructing the device also gives much better insight into how it works which is something that will undoubtedly come in handy should you need to troubleshoot problems at a later date. Although as stated above Asterics Academy provide a list of all components a much better option in my opinion would be to purchase the construction kit which contains everything you need to build your own FlipMouse, right down to the glue for the laser cut enclosure, all neatly packed into a little box (pictured below). The kit costs €150 and all details are available from the FlipMouse page on the Asterics Academy site. 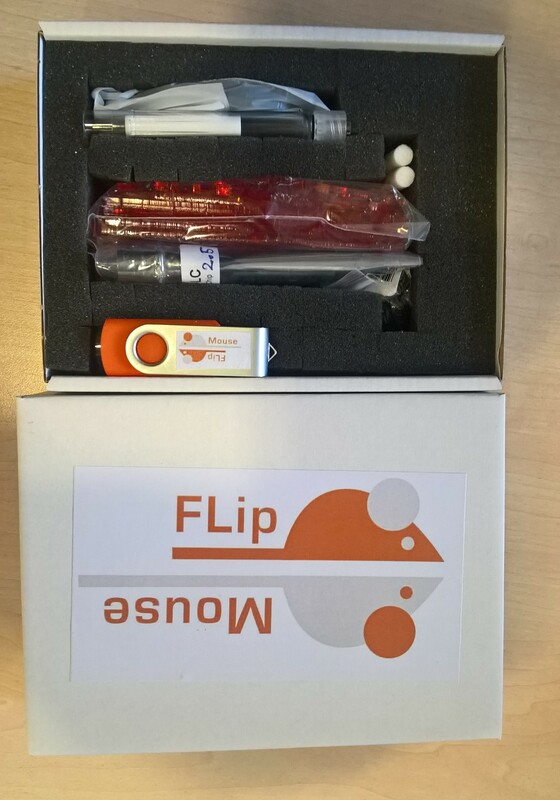 Next week I will post some video demonstrations of the device and look at the GUI which allows you program the FlipMouse as a computer input device, accessible game controller or remote control. I can’t overstate how important a development the FlipMouse could be to the future of Assistive Technology. Giving communities the ability to build and support complex AT solutions locally not only makes them more affordable but also strengthens the connection between those who have a greater requirement for technology in their daily life and those with the creativity, passion and in-depth knowledge of emerging technologies, the makers. Here’s hoping the FlipMouse is the first of many projects to take this approach. One of the more dubious advantages of working in a long running Assistive Technology service is access to an ever growing supply of obsolete hardware. While much of it is worthless junk now considering the technological progress in the field over the last 10 years, there are some real gems to be rediscovered. These were innovative solutions of their time grounded in strong research and while being seemingly made obsolete by a newer technology actually still have much to offer. The LOMAK keyboard is certainly one of these and being possibly the only piece of AT on permanent display at New York’s Museum of Modern Art I’m obviously not alone in thinking this. The LOMAK (Light Operated Mouse And Keyboard) was invented by New Zealander Mike Watling and first came on the market in 2005 after a number of years research. It allowed hands free computer access through the innovative use of a laser pointer and light sensitive keyboard and mouse controls. To make the light sensitive keyboard and mouse (I’ll call it an input device from here) Watling used an array or photoresistors, one for each keyboard, mouse action and setting. This amounted to a whopping 122 photoresistors and possibly the most electronically complex input device ever marketed. Although complex the idea behind the LOMAK is quite straight forward. Photoresistors change their resistance depending on the amount of light they are picking up. Once you figure out roughly how much shining a laser pen on the resistor changes its value you have a good idea of where to set your threshold. You can then use the photo-resistor as a straightforward momentary switch, like a keyboard key, that activates once the resistance goes above/below a certain threshold. If you are like me you will want to see inside this thing so here it is.. (Below), a thing of beauty I’m sure you’ll agree. So why aren’t more people using LOMAK keyboards today? Well eye tracking technology was just starting to become a realistic possibility for AT users with devices like the Tobii P10 hitting the market. Eye tracking just made more sense for computer access, it allows a neater more mobile solution and it a more direct input method. What has given the whole concept behind the LOMAK a new lease of life is the availability of cheap user-friendly prototyping platforms like Arduino. This was the basis of one of the project proposals we made available to the final year students of the BSc (Honours) Creative Media Technologies course in IADT. Over the last few years Enable Ireland AT service have worked with IADT lecturer Conor Brennan to provide students with a selection of project briefs that both fit with their learning and skills while also fulfilling a need that has been recognised through our work supporting AT users and professionals in the area. This particular brief was to create a MIDI interface based on the same concept as the LOMAK that would allow someone to perform and compose music using only head movements. 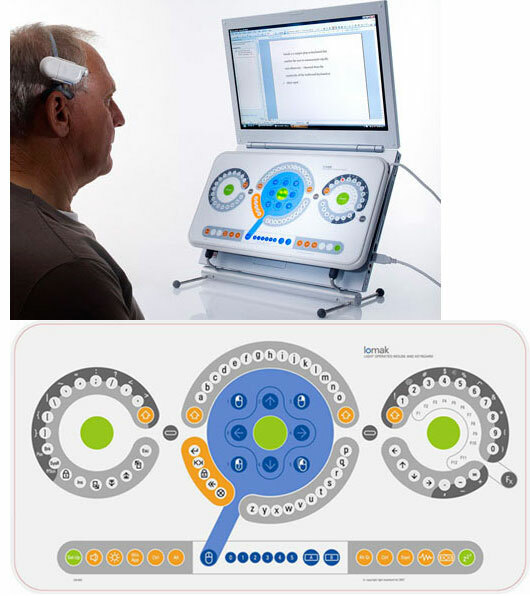 There are solutions available that use eye tracking to achieve this, for example the fantastic EyeHarp and more recently Ruud van der Wel of My Breath My Music released his Eye Play Music software. However these solutions all require a computer, we wanted something that was more in keeping with current trends in mainstream electronic music which seems to be moving back to a more hardware based performance. Thankfully a particularly talented student by the name of Rudolf Triebel took on the challenge of designing and building what we are now calling the MILO (Musical Interface using Laser Operation) (previously called LOMI Light Operated MIDI Interface which I think is much better..:). Rudolf exceeded our expectations and created the prototype you can see in the (badly filmed, sorry) video below. He has also created a tutorial including wiring diagram, code and bill of materials and put it up on Instructables to allow the project to be replicated and improved by others. If you would like to see and maybe have a go of the MILO prototype (in its spanking new laser cut enclosure) Conor Brennan of IADT will be showing and demonstrating it at the 25th EAN Conference which takes place in University College Dublin between Sunday 29th – Tuesday 31st May. Keep an eye on electroat.com where I hope to add a few more detailed posts on building, modifying and increasing the functionality of Rudolf’s design. I will also look into the possibility of using the same concept for building a hands free video game controller. The FLipMouse – alternative computer input device is a combined Joystick, Spi&puff and Switch interface. By combining three established input methods in one device this innovative computer access solution could offer efficient computer access to a range of people with significant physical disabilities. very low forces are sufficient to create up/down/left/right movement. can be used with fingers or toes etc. can also be used as a mouthpiece (actuated by lips / mouth movements). If desired, sip / puff activities into the mouthpiece can trigger additional functions. One function selection switch, to change the active configuration of function. Two 3.5mm jack plug sockets for attaching external switches to trigger additional functions. 3 Indicator Leds for showing the active configuration, calibration procedure etc. Additional upgrade modules for future extensions (e.g. universal infrared remote control). Firmware upgrade via Arduino IDE (the reset button is only needed for this purpose). by touching the mouthpiece with the lips or fingers and applying small forces in vertical or horizontal direction. by increasing or reducing pressure in the mouthpiece (puffing or sipping). by actuating (up to) 3 momentary switches. 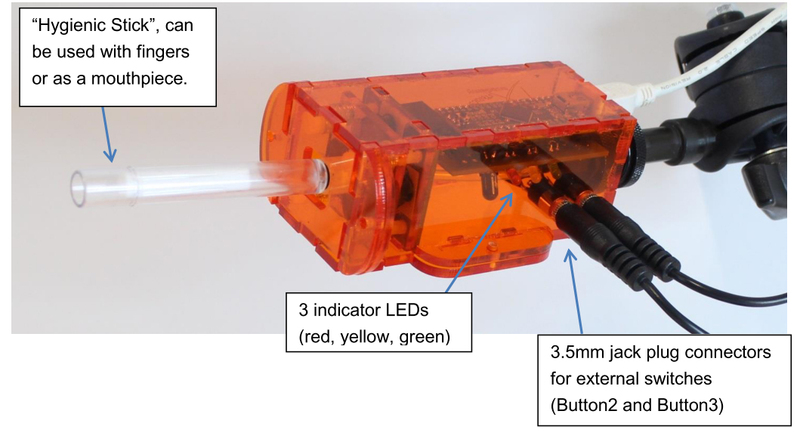 if desired, a longer plastic tube can be attached to the pressure sensor so that the joystick can be used with a finger and a separate mouthpiece allows sip/puff control. With the FlipMouse GUI application, the functional mappings of the user interactions to desired mouse- or keyboard activities can be defined and stored in the FLipMouse’s memory. The settings stay saved also when the power supply / USB cable is removed. When the FLipMouse is plugged in the next time, the settings will be available – also if you use another computer or operating system. The FLipMouse offers multiple internal memory slots to store different functional mappings that can be used with different applications or tasks.